Rutabaga, What Is It and How to Cook It? Every single time I shop a rutabaga in Whole Foods, the cashier asks me what that is. The problem is that I can never pronounce it the way Americans do, so we always need a little time to figure out how to add it. The thing is I really love to cook with this root vegetable, also called ‘swede’ in Europe, so I wanted to share the ways I enjoy it. What happens if you cross a cabbage with a turnip? Rutabaga happens (happened a long time ago between a wild cabbage and turnip). 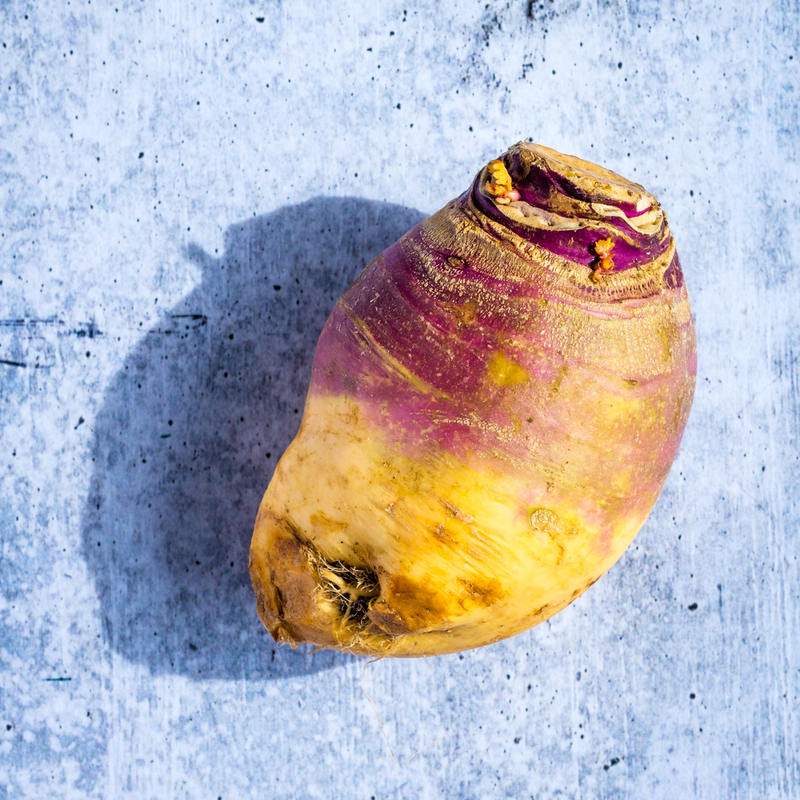 Rutabaga, also called swede is super popular in Nordic cuisine and is cooked in a variety of ways: boiled, mashed, roasted, fried, in casseroles and stews. 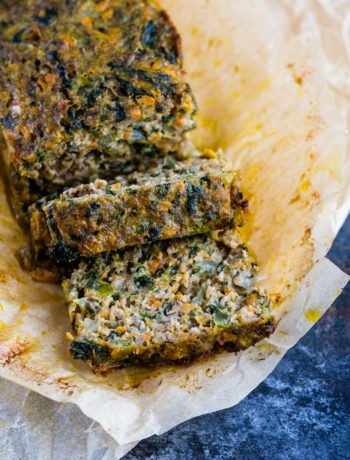 It can be added in any meals you would add potatoes, but I have a favorite way to cook it. What I love about rutabaga is that it gets really crispy when fried (and by fried I mean sauteed on medium to high heat, not deep fried) or baked. But, it has a strong and interesting peppery flavor, something in between cabbage and turnip (makes sense, right?). For this reason I feel rutabaga needs to be balanced with something else, and one of my favorite pairings is Japansese sweet potato, the one that has a purple skin and white-ish flesh. What about nutrition? Rutanga is considered part of the cruciferous family, and according to Mercola.com has antioxidant properties and is rich in Vitamin C and iron. Rich in beta-carotene, rutabaga is also an excellent source of manganese and potassium, rich in fiber, thiamin, calcium, magnesium and phosphorus. 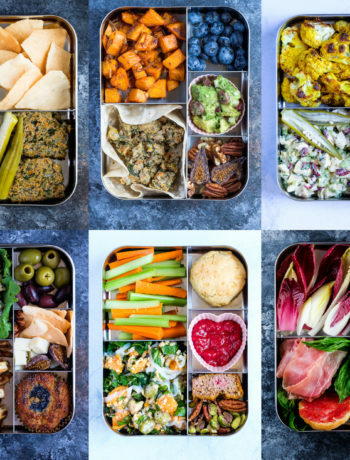 In The Plant Paradox and The Longevity Paradox food lists, rutabaga is listed under resistant starches, ‘in moderation” , which means you can enjoy it few times a week. 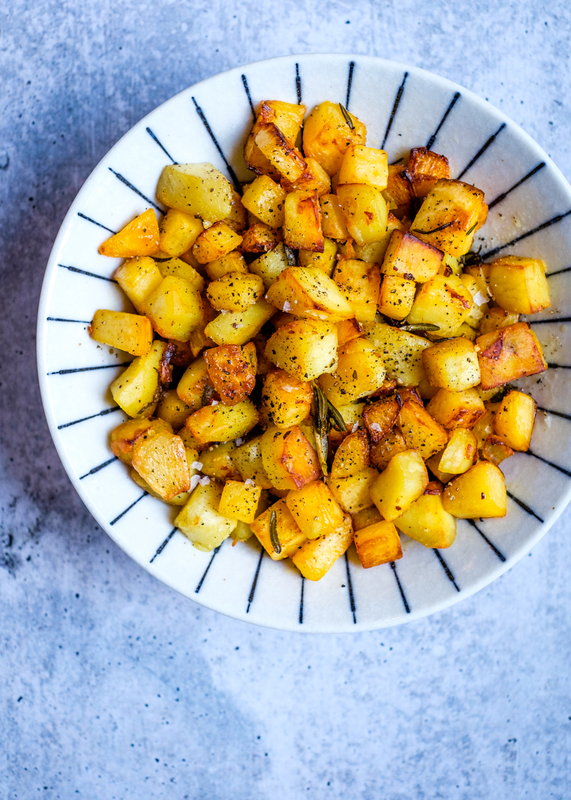 Make sure you have it with lots of extra virgin olive oil and don’t forget that the resistant starch content increases when cooled and re-heated (which is a good thing). I normally rotate between resistant starches, so will not have rutabaga that often (maybe a couple of times a month). I peel the sweet potato and rutabaga, wash them with cold water and cut them in about 1/2 inch cubes. I add them to a hot stainless steel pan with extra virgin olive oil or avocado oil, a generous amount to cover the pan, but not too much; you don’t fry them, you sautee them. Add a spring of fresh thyme or rosemary and stir well so all the cubes are coated with the oil. Cook for about 20-30 minutes on medium heat and continue to stir occasionaly so they get browned evenly. Whenever they get a nice golden brown color they are ready. I like to add a generous amount of sea salt or a good quality salt about half way in. This way they have time to soak all the salt flavors. Take them out and serve as a side dish. You will notice there is a slight difference in texture and taste between the sweet potato and rutabaga and each mouthful is a surprise (they look pretty much the same), because you never know which one you are getting. Part of why I love this dish. You want to get fancier? Try adding few pieces of chopped onions and/or bacon. You can also sprinkle some all spice in or maybe add some paprika before serving. There is certainly way to be creative. One medium rutabaga and one medium sweet potato make about two servings and will cost you about $1.50. Also a great dish for meal prepping, it’s easy to warm up and even tasty cold. Add some fresh extra virgin olive oil on top when eating. 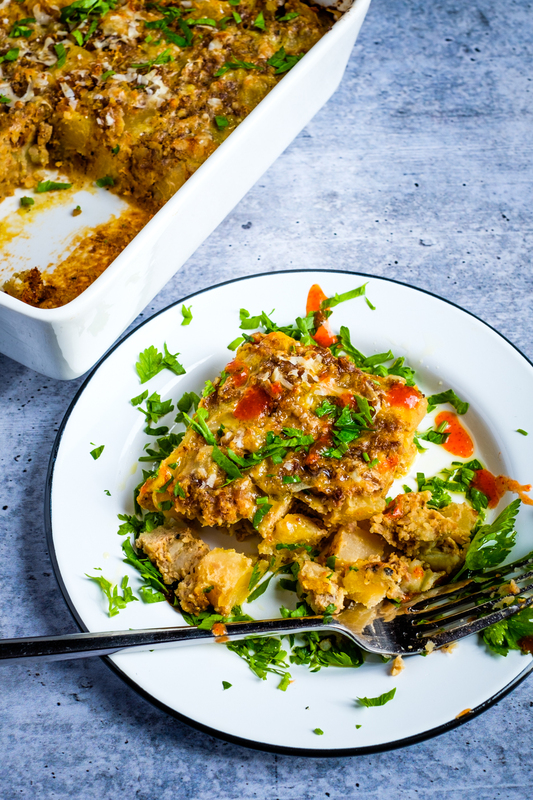 Another way of cooking this dish, giving almost the same result, is on a baking tray, in the oven. But, if you want the browning to happen don’t use parchment paper. Best way to make is is in a stainless steel sheet pan. I experienced with low temperature, on the lower rack and finished it at high temperature, or you can just cook it in the middle at 375F – 400F until browned, stirring in between. 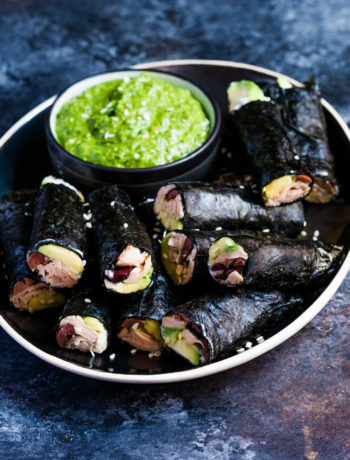 Use avocado oil or extra virgin olive oil. And in case you wonder, yes you can cut them as fries instead of cubes, but in my experience they get crispier when cubed. 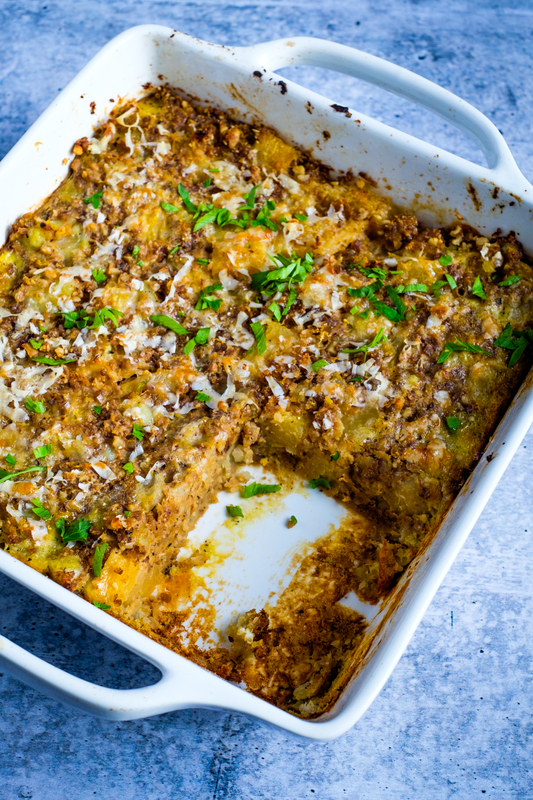 A casserole is a another great way to cook and eat rutabaga. 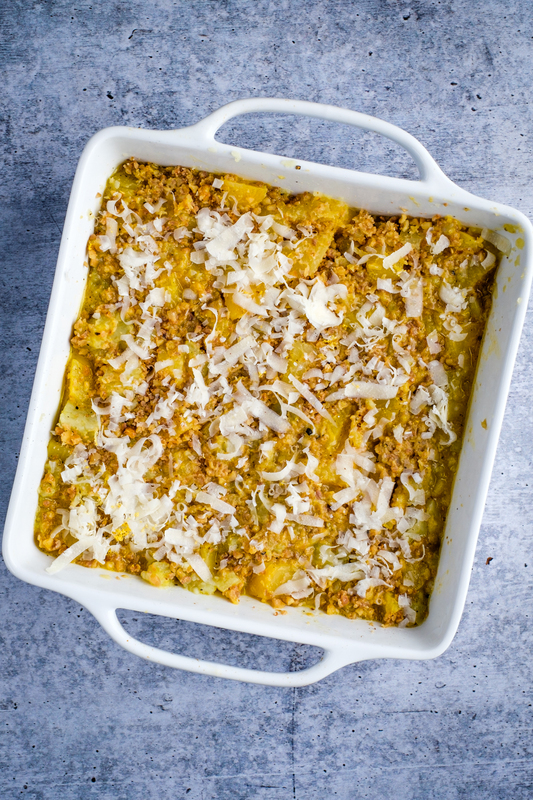 You need: one medium rutabaga, one medium Japanese sweet potato, 2/3 cup peeled, cooked chestnuts (I found a great organic and affordable brand at Trader Joe’s), 1/4 cup walnuts, 2 pasture raised eggs, a handful of grated Parmigiano Reggiano, salt, pepper, one grated nutmeg, lemon zest of one lemon, extra virgin olive oil, fresh chopped parsley. Peel, roughly cut and boil the rutabaga and potato until fork tender. In the meantime process the walnuts and chestnuts in a food processor, until they resemble a crumble. 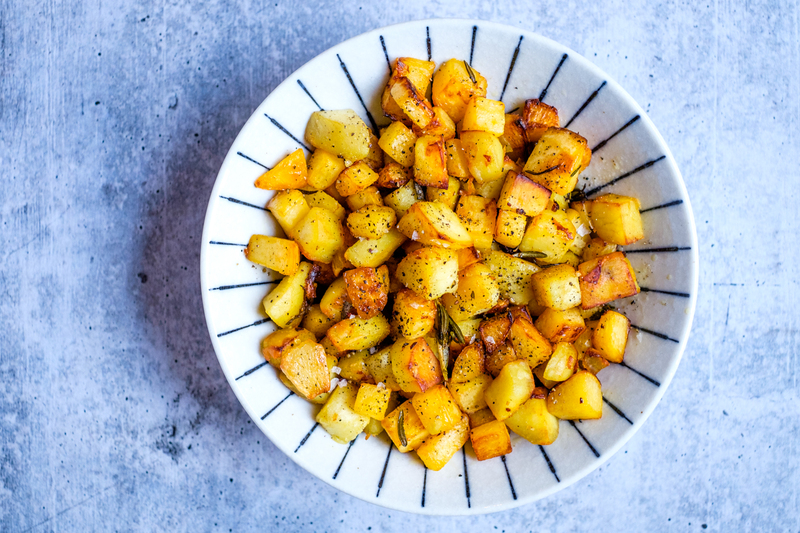 Add the cooked rutabaga and potatoes to an oven dish with a little of the boiling water (few tbsps), extra virgin olive oil, salt and pepper and loosely mash (you want some of it mashed but also some chunks in between). Beat the eggs with nutmeg and lemon zest and pour on top of the mash. Add the crumble mix and stir and mix with the rest of the ingredients. Sprinkle some Parmigiano Reggiano on top and bake at 375F for about 25 minutes. Serve with fresh parsley and hot sauce and drizzle a lot of extra virgin olive oil on top. You can have it as a side dish or main. For extra nutritional balance add a green salad next to it. Makes about 6 portions. I eat some fresh and the rest freeze for later use. You can warm in the oven or in the microwave. You can add it to soups, stews or to a roasted vegetable medley. You can use it anyway you would use a potato. It has a slightly spicy, peppery taste though, that’s why I like to balance it out with other veggies. Nordics like to use all spice seasoning with rutabaga, and I also like how it works with fresh rosemary or thyme, salt and pepper. Always add extra virgin olive oil when serving, and maybe some protein, for a slower release of the sugars / carbs. 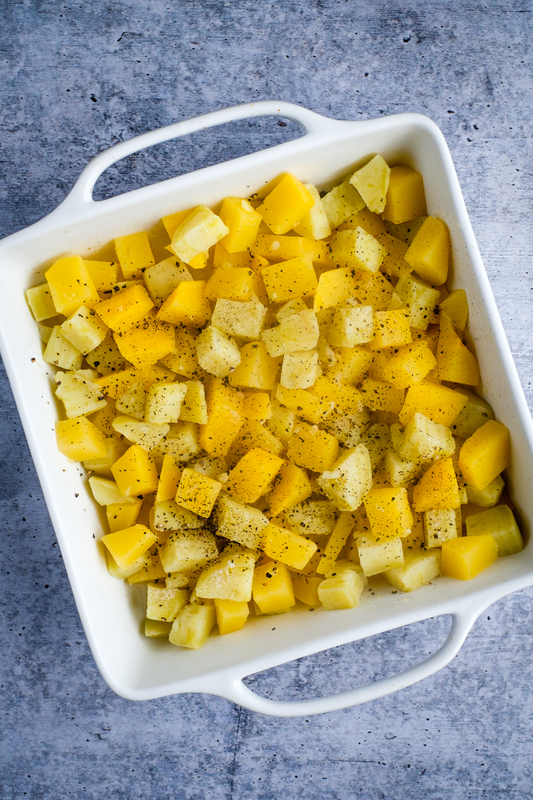 Comment below if you have a favorite way you cook rutabaga or try any of these recipes. Perfect title and post for me. My husband just came home with rutabaga from the grocery store.